Being an archaeologist who studies the Tsukuba area must be an exciting job. I mean, have you ever taken a look at the map (which can be found at the Tsukuba Central Library) of this city`s officially recognized ruins. If you have even the slightest interest in the mysteries of the past this will get your blood flowing fast. There are literally hundreds of sites dotting this map, representing every important Japanese pre-historical and historical period- from 30,000 year old stone age sites replete with the tools of that time, to KAIZUKA- the shell mounds which later had been used as garbage dumps by the ancient inhabitants of this area ( providing a treasure-trove of clues regarding how these people lived). Then there are the KOFUN ( burial mounds) built to inter the remains of ancient local strong-men ( there are about 200 of these alone within the Tsukuba City limits!). 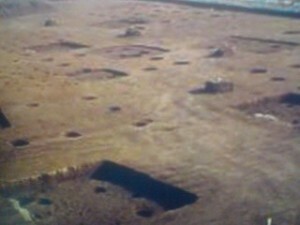 There are the remains of temples and government offices which stood in the area during the Nara and Heian Periods, plus dozens of villages which can now be identified by lower portions of wooden posts which have remained preserved in the soil over the centuries, and Warring States Period fortresses which now survive mostly as wooded hills. But the men and women who do the work of studying these local riches are also under alot of pressure. Unfortunately,they more often than not have to carry out what should be patient scientific surveys of these sites, at a frantic pace, with construction companies and the mayor looking over their shoulders. There are certain people chomping at the bit to get to the work of paving over these significant spots and laying the concrete. One cannot help but suspect ( given the valuable places that are slated to be imminently covered over), that there is even pressure put on specialists to downplay or ignore the significance of certain exciting findings which would otherwise bring construction projects to a halt ( this has happened in the Hirasawa Area, near Mt Tsukuba, where the remains of what might be an old government office had been found- that spot was chosen to be turned into a history park and is beautifully preserved- all other places- many of equal interest will have no such stay of execution). I guess we COULD look on the bright side, however. Back 40 years ago when the first big roads ( for which Tsukuba is famous for) were built for the new Science City, the work crews just bulldozed in a STRAIGHT LINE- with no consideration at all to history or nature. (Read my post on the old Hanamuro Castle Ruins). At least now, AS A RULE, archaeological studies are carried out before just about every construction project. Reports are made, artifacts are saved. 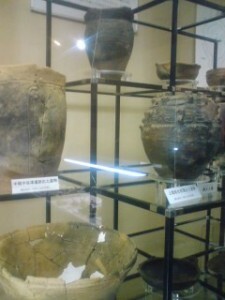 For the rest of this week, and then through next month, and then again through Jauary, some of the artifacts which have been unearthed in Tsukuba will be on display. First at the Sakura History Museum ( at the Old Sakura Branch Office) until this coming Sunday. 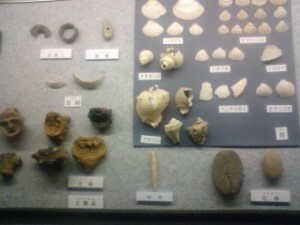 There you can also enjoy the small but interesting permanent displays which include the fossil of a type of primitive elephant, an especially beautiful example of a Kamakura Period SACRED STONE ( which greets you as you enter the little hall), and a wide assortment of the traditional tools of daily life which had been used in this area for centuries. 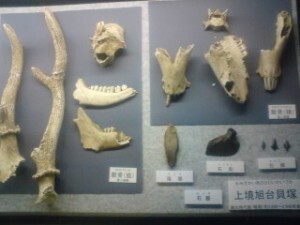 This location iself is also of great interest as the buildings which were once the Sakura Branch Office stand on a spot rich in artifacts ( and in fact much of what you will see was discovered within a five or ten-minute walking distance of the museum). The special display will then be moved to the Yatabe Folklore Museum ( in the same building that houses the Yatabe Library- across the road from the Yatabe Branch Office. Getting a good close look at the earthenware jars ( of various levels of sophistication), arrowheads,the remains of shell and bone from repasts of long ago, and various other goodies which have been unearthed, should be of interest to anyone who lives here. It might get you to conjure up in your mind images of the ancients making and using these implements. I found the liitle display especially exciting because I actually lived for many years right amid some of these most important sites, and would watch the work from my window- sometimes chatting with the workers. It is very hard for me to imagine that these areas will soon become just some other housing developments. My concern is not only for the historical value of these places, but also for the survival of the rich plant and animal life which has sprung up over the years in the area s of archaeological interest- because they had long been left untouched, waiting for their turn to be excavated. DO NOT EXPECT TO FIND ANYTHING LIKE WHAT YOU WOULD SEE AT A GREAT MUSEUM. But for those of us who live in and love Tsukuba, these little treasures are a precious part of our heritage. The Former Sakura Branch Office can be reached by the Tsukubus ( the Oda Shuttle). And if you are on bicycle, it only takes about fifteen minutes from the Center, as well.